I love the prophetic! 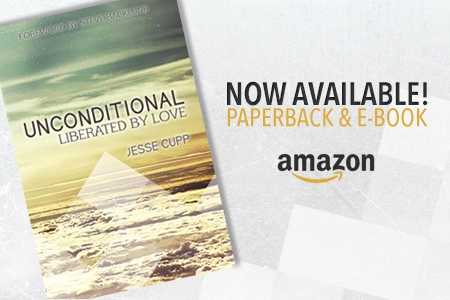 Most of my life has powerfully advanced from it, including the journey of pursuing my wife, Jessica. God desires to be the guiding host of our destinies. The prophetic is a wonderful support gift to help us find our way along as we do life. One thing I’ve learned over the years is the wisdom of letting time prove the interpretation and allowing process to validate it. I’ve had too many prophetic words that had other outcomes than the ones I tried to produce. We must keep in mind that we are human and, no matter how prophetic we may be, we can still miss it sometimes. Humility will accept that fact, and wisdom will set up checks and balances to help us not veer off track. We know in part and prophesy in part (1 Corinthians 13:9). If used properly, the prophetic is a wonderful tool to help assist us in discovering God’s paths before us. The concern is when it is not used properly, especially in high stakes situations. We must keep in mind that marriage is among the utmost highest of stakes because it is a covenant before the Lord, between heaven and earth, eternally binding until death due us part. This decision of marriage should be approached with great joyous celebration; but the process of coming to that decision should be approached, on some level, with fear and trembling. I am no relationship expert, and God knows I am not aiming to be. But I do care very much about healthy people and their relationships. So I want to offer a smidgen of advice to all my friends who are trying to figure out what role the prophetic should play in choosing your spouse and moving things forward. Put your prophetic gifting amongst the lower ranks of confirmations! 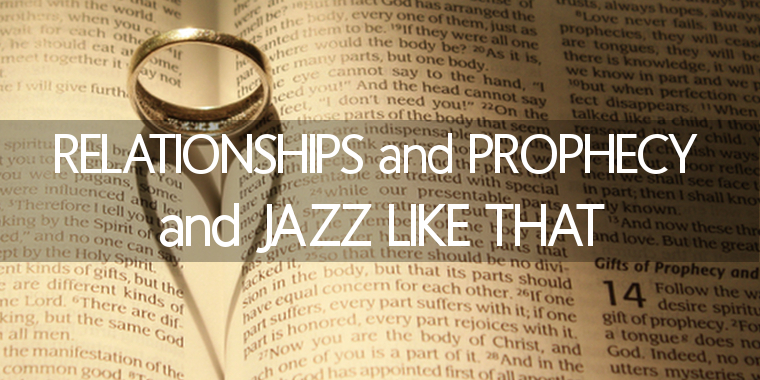 As powerful as the prophetic is, it is NO SUBSTITUTE for taking time to get to know someone. Allow me to share with you some practical steps that should take precedence over prophecy as you try to discover if that person of interest is the right one or not. The prophetic can support the process, but it can’t replace it. How about actually taking time to get to know one another, rather than relying on instinct to convince you? Spend the time it takes to discern if there is compatibility of personality and course of life. Enjoy taking plenty of time to experience each other in various settings, situations and companies of people to see if you really like how each other acts in unpredictable situations. Discover if you are good with how they handle conflict resolution! Get to know each other’s families and spiritual families. It is honor to invite them into your process. It will also be very insightful of where your “significant other” comes from and where their unique behaviors derive from. It could be telling, in a way that may reinforce your love or bring you new concerns to consider. Courtship, dating, or whatever you like to call it, the point is taking a season without high-level commitment to get to know the person. Hint of advice: the euphoria of being love drunk is a beautiful experience… for the right time and person. But in the early stage of getting to know if this is “the one” or not is a time you want to remain sober-minded in order to get a clear view of who they are. Otherwise, you may end up with a romantic hangover, and the cloud will eventually lift to unveil the real person after you’ve already given away your heart. Rose-colored glasses make everything appear perfect. Don’t get the cart before the horse! “Watch over your heart with all diligence, for from it flow the springs of life,” (Proverbs 4:23). Invite spiritual parents/trusted leaders in as a source of wisdom and covering. This means they should know both partners enough to feel they can validate and endorse the relationship. Entrust them with all you can about your relationship: the good, bad and ugly. They need the full picture in order to help you properly. Be honest and open. Fess up when needed! Allow them to speak into your life what they feel you need to help you succeed. Bring your community around you to support you and offer feedback. Again, this means they know both partners enough to feel they can validate and endorse the relationship. For this to have its best effect, this should begin before you enter a relationship and last all the way through it. Both partners, be willing to hear feedback even at the expense of your own biases. Not only willing to hear it, but willing to set it before the Lord to see if He wants to validate their words. Allow yourself time to mediate on their thoughts to see if your heart may eventually find wisdom in it. “Where there is no counsel, the people fall; but in the multitude of counselors there is safety,” (Proverbs 11:14). Take time to lay it on the altar of God to see what He has to say about it with an objective and unbiased heart. If you have already determined in your heart what you are going to do and nothing can change that, you probably don’t have this one on the altar. If you are placing it in God’s hands in full trust (which is the same as laying it on that altar), you are in good hands, and He will protect you and your future by leading you in the ways of blessing. Think Abraham and Isaac and his willingness to obey God even at odds with his heart’s desire (Genesis 22). “Not my will but Yours be done,” (Luke 22:42). Remember that until you make a covenant, this person still may not be the right one for you, and there is always an out. But once covenant is made, you lose all rights to second-guess if they were the right person. Take the process seriously! Take the time to build trust and heart-connection. Develop the substance of an actual sustainable relationship. Begin to experience that euphoria you’ve longed for! In proportion to your level of commitment. Stay safe by keeping it under the covering of those leaders you’ve brought into your relationship. Understand the utmost importance of safeguard boundaries and accountability to help protect purity and healthy connection for this. As all of these things have been accomplished, the prophetic gifts can be awesome clues from God to validate the true substance that is being built. Allow Him the time to confirm the words how He chooses as you continue to do the practical steps of building substance and history with that person you love. But don’t get too hung up on the words or signs, because again, we are all human and have the ability to miss it at times. Cut yourself and your person of interest a little slack. Let time, experience, and community be your validator. And then just enjoy the process! Oh, and by the way, you might not want to share your prophetic insights about the relationship with your partner just yet. Maybe wait until after you have both individually and mutually come to terms that it is what you both want, like maybe even after engagement, so you an celebrate the words together. Otherwise, you might enter into the practice of manipulation. You want the person you love to choose you because they chose you, not because you convinced them. It was impossible for this blog to cover everything, but it gave a lot of groundwork to build from. From the context of this blog, what are some specific questions you wish to expound on more? Feel free to comment below with any thoughts or questions you would be curious to hear more on. Please share if you enjoyed this blog! Reading this blog, I felt like I was chewing on a big steak, it was so meaty with wisdom, I know that I personally am so hungry to learn from other people in their relationship experiences, because I can feel the time drawing near when my heart will be handed into the arms of my life partner. I have been so drawn to sermons, and teachings on this very subject and I’m finding myself learning so much (ex. Being a godly wife, how to submit, how to grow with your spouse in Christ etc. I so much appreciate you sharing and will be saving this blog for reference in the future! I’m definitely going to be reading this many times over, because there is sooo much more to chew on! Thanks for reposting this – What would you say is one of the best things a single person can do right now to prepare for meeting their future spouse?